A given individual today might have four or more phone numbers; two to three email addresses; as well as separate mailing addresses for home, work, and one or more satellite offices. 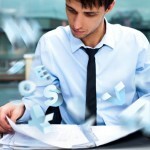 It can be difficult to track all this data on a business card or in a paper format. 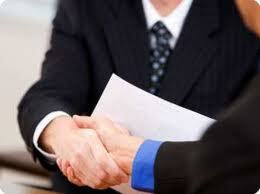 It is recommended to have an electronic system or application to manage contacts and relationships. Electronic systems offer a number of benefits over collecting and filing business cards. Often when we receive business cards, they end up scattered in a desk drawer or consolidated into a big stack. When we need that data, it is difficult to access or use. Relationships are a powerful tool in today’s business world. Utilizing your contacts as resources and potential sales maximizes your business potential. After you enter business and contact information into an application, you have the power to market and utilize these contacts fully through mailings and email. Microsoft Outlook: Most workers already have Microsoft Outlook installed on their systems. The folder ‘Contacts’ is where contact information can be entered to sync with most mobile devises. ACT! : One of the market leaders for small and medium sized businesses, this productivity tool, was designed around contact records that manages calendar and tasks lists as well. Mac Address Book: Mac has their own internal contact management application that syncs seamlessly with all other apple products. · Gmail Contacts: Google’s application to manage contact and business cards. The beauty with Google is that it syncs with almost all mobile devises and is cloud-based accessible. Easy to use but not a lot of contact management functionality. Copy2Contact: This is a third party Microsoft Outlook plug that converts signatures into new contacts automatically. Duplicate Contacts Eliminator: Scans Outlook Contacts and eliminates and/or merges duplicate records. CamCard: This mobile devise application takes a picture of a business card and then translates into text and exports into Excel, Outlook or the primary address book on the mobile device. CardScan: The leading card scanning equipment and software in the market. The system scans in business cards and then exports them into a wide variety of productivity and contact management systems. Great, system for those individuals who have lots of business cards that need to get entered electronically. · Plaxo: A web-based contact management tool that has been in the market place for awhile and now interacts with other platforms such as Outlook, Apple and Gmail. It will email your contacts for updated contact information usually annually or per request. · Companion Link: This application syncs contacts, calendar, tasks, notes from application to application and mobile devise to mobile devise. • Remember the Milk: A great free task tool that syncs with Google mail, allows tasks to be emailed as reminders and has a good platform to manage separate tasks lists and projects. • G-Tasks A free task app that syncs your Android phone with Google Tasks. You can view your tasks on any mobile devise. • Toodledo. A task list with more functionality then the simplified Google Tasks but not as robust as Remember the Milk. You can add a Toodledo sidebar to the Google Calendar. • Cozi This online time management tool was specifically designed for families. It has calendar, task lists, reminders and shopping lists. This way no matter where any family member is, they can access and add information. • iPrioritizeAn online task list that will email tasks to you and also can be viewed from mobile handheld devises. • Jibidee an online calendar, task list that can be shared with friends and family. It also has a place to save, create and change documents. If you would like training for your staff and employees on task management, see our course Getting Tasks Done for more details. Or contact us for pricing and more information. Compounding the sheer volume of email is even more problematic because most of the e-mail we do get, we don’t really want. The London Times in 2010 reports that eighty eight percent of e-mails are considered junk by the average office worker including spam, newsletters, solicited and unsolicited e-mails. One way to reduce the email inbox clutter is to set up email rules and filters. Use the rules or filters function, available in your email program, to help in the initial sort of incoming e-mail. Some e-mail software will use the term “filters” and other software will use the term “rules,” and they are essentially the same function. When you set up a rule or filter, the incoming e-mail will re-direct and move to a different file folder. It is then diverted from your in-box entirely. This is particularly helpful for filtering distribution lists and/or newsletters that you may not need to see daily and could review on a weekly or monthly basis. This is also particularly useful if you have a friend who always forwards jokes or other unimportant e-mail that you can filter out automatically. 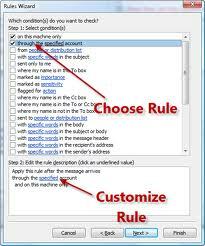 Click here to learn more how to set up a rule in Microsoft Outlook. Click here to learn more how to create a filter in Gmail. Once actions have been delegated, then the delegator can use the functionality within productivity software to track and manage those delegated items. The following are three methods to track delegated action items using the Task function in Microsoft Outlook but can also be applied to other productivity software’s such as Lotus Notes or Google. Create a category. Using categories in Outlook allows users to view e-mails or tasks assigned to a person in one group. In Outlook, there is only one category list to use for all functions including Calendar, Email, Contacts and Tasks. First, create a new category by the person’s name. Then, categorize e-mails or tasks that have been assigned to that person simply by right clicking on the task or e-mail item, choose Categorize and then click on the person’s name. Once items are categorized you can view them by category by clicking on View/Arrange By/By Category. When having a one-on-one meeting follow-up items can be quickly accessed by using the category view. Create one task item. Another option is to create one task for each direct report or delegatee. Name the subject line of the task item by the person’s name. In the text and notes section of the task window, type in a listing of all action items with due dates. This can then be one location for all the delegated items for that person. In Outlook, you can also create a table from the Insert ribbon inside the notes section of the task list. This can make it easier to track actions by creating columns for the action item, due date, completion date, notes and status of each delegated action. Create separate task folder. In Outlook, separate task folders can be created. Click on the task folder and go to File/New/Folder and the Create New Folder dialogue window will open. Enter in the name of the person and click OK. This will create a new separate sub-task folder by that person’s name underneath the primary task folder. Then create individual task items under this new task folder for the delegated action items. All delegated task items are then organized under one task folder to make it easy to manage and track.